After the parade and the award ceremony in the park, I ended my night at Roadkill Bar where, in addition to their always popular Wednesday karaoke, they were hosting a good old fashioned hot dog eating contest. This should be good. I have watched the Nathan’s 4th of July Hot Dog Contest on TV a few times before. These pros can eat. How about Joey Chestnut, the world record holder & winner of the Mustard Yellow Belt, who ate 66 hotdogs in 12 minutes? 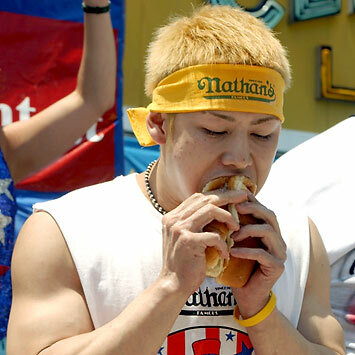 Or 128lb super eater Takeru Kobayashi, who ate 69 hotdogs in the same amount of time (but not at Nathan’s). (Kobayashi has lots of other records too…he ate 17.7lbs of cow brains in 15 minutes in Japan). Check out some other crazy records in competitive eating at the end of this blog. Yack. There was a good crowd at Roadkill, but only 4 entrants. I can see why…it would be difficult to shove a dozen hotdogs in your stomach after a full day of dancing, drinking and roasting in the sun. I wasn’t entering either. But there were four participants: Helda (who co-owns Roadkill Bar), Anna and Gunther of Mathieu’s Deli and Wade the Gringo. A dozen “Island Dog” hotdogs were set up for each eater. I mean…if the record is 66-69 dogs in 12 minutes, these guys should be able to eat at least 10 in 10 minutes, right? Wrong…it must be tougher than it seems. Here are the eaters. Here’s Helda with an evil grin. Gunter was eating only the meat and not the buns…cheating, I say. Wade was clearly in the lead. In the end, I think he ate 5 and won. FIVE? Let’s just say that we aren’t going to be sending Wade to Coney Island anytime soon to represent San Pedro. But he did win a bar tab…and for that, he was happy! And the crowd was very amused. And then… the karaoke continued. Good good times.